THE KNEEBONE BOY is now in PAPERBACK! The Kneebone Boy by Ellen Potter reminds me a bit of colorful puzzle pieces that don't seem to make a picture until you have fitted the last few pieces in. Three or four chapters into the book it seems like it's going to be one kind of story, half way through the book you are sure it's a different kind of story. It is not until the end of the book that you realize just what kind of story it is, and even then it is hard to pin down. 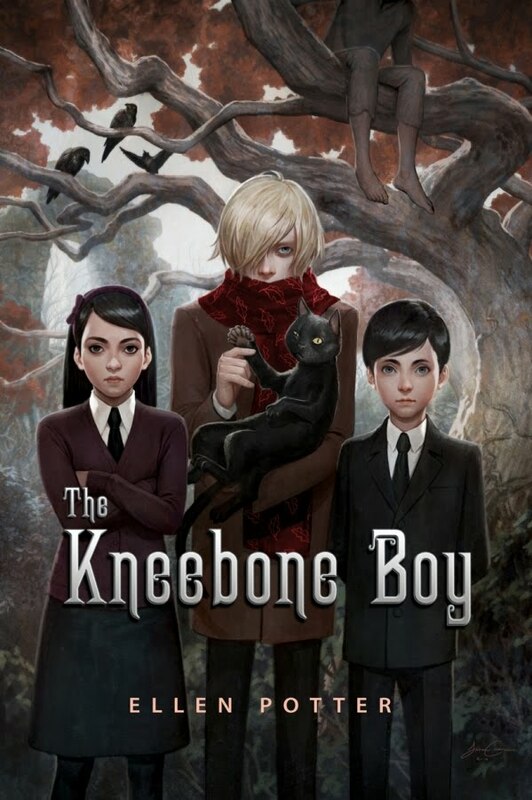 The Kneebone Boy is a mystery wrapped in an adventure, cloaked in a gothic tale, spiked with oddities and observations by an unknown narrator and finally is, at it's heart, a story about families. And, while this book is remarkably different from Potter's last book, the profoundly moving SLOB, which is also quite different from her series of books about Olivia Kidney, an artistic outsider who can commune with ghosts, they all share the wonderful quality of being layered stories filled with intriguing characters who all share a deep love for one another - sisters, brothers, fathers and even adopted mothers. Ellen Potter has a true gift for taking a difficult, painful and even traumatic childhood event and wrapping it in a fascinating, funny story with an embrace like a warm, colorful scarf on a cold, grey day. The scarf is a great choice for my lame simile, as it is a boy and his scarf that got this whole story started in the first place. As she says in her blog, Ellen Potter had a high school crush on a boy who always wore a scarf, whatever the weather. Classmates speculated as to why he wore the scarf - a "freakishly long neck?" "a parasitic twin...with an actual baby's hand growing out of the side of his neck?" She never figured out why he wore the scarf (although she did Google him and discovered that he is now famous and had replaced his omnipresent scarf with suspenders - any guesses readers???) and the mystery stuck with her. When she sat down to write her next book, she couldn't get the character of the boy in the scarf out of her mind. She began to follow him to learn interesting things about him and his life, writing her story up around him until she reached page 205 and still didn't know why he always wore that scarf. And her manuscript was overdue. Fortunately for us, she figured it out. The Hardscrabble children, Otto, Lucia and Max are aged 10 - 13 and it is one of the three who narrates The Kneebone Boy, speaking directly to the reader at times. If you don't get completely sucked into the story, you may find yourself combing the text for clues to which if the Hardscrabbles is telling this story. It could be Lucia. After all, the narrator does pause to say, "I'm beginning to think that you are pronouncing Lucia's name as though it were Lucy with an a at the end of it. That's wrong. You pronounce it Lu-CHEE-a. Say it a few times out loud and you'll forget about Lucy-a." But, the narrator also tells us that, "no one knew what Max did up on the chimney, and no one cared enough to try to find out. Which just goes to show, you should always pay attention to the youngest." Or, it could be Otto. Even though he has not spoken since their mother Tess disappeared five years ago, using a sign language of his own invention to communicate with Lucia, he has a fondness for collecting oddities - animals, objects, people and stories - and the narrator of The Kneebone Boy definitely has a feel for describing oddities of all sorts. The Hardscrabbles live in the village of Little Tunks with their father, who paints portraits of deposed royalty. This is a sketchy business and the payment is even sketchier. Since their mother disappeared and a police search was conducted, rumors have flown about the town as to what really happened to her. Some suspect their father, Casper, but most think that silent, scarf wearing Otto is hiding a wicked temper that resulted in the disappearance of Tess. To add to their misery, the children often have to spend days or weeks at a time with the awful Mrs Carnival while Casper travels for his work. Lucia longs for adventure and, when the children are sent to London to stay with cousin Angela and a mix-up occurs, they get just that. After a frightening night in the city they pool their resources and decide to head to the town of Snoring-by-the-Sea after finding a cryptic letter from Casper's "loving aunt-in-law," Haddie Piggit, a woman they have never met. They find Haddie living in a castle folly, a word for a structure that is often not much more than a fancy garden decoration. In this story, the castle folly is a miniature replica of Kneebone Castle and was used as a playhouse by the Kneebone children. Hattie is renting it, spending the summer away form her home in America. Once in Snoring, the children meet a taxidermist who drives a horse drawn hearse, learn the legacy of the Kneebone Boy, think they have seen the Sultan of Juwi (one of the deposed royals who's portrait Casper painted and who is on the run from the assassins who killed his family) and get closer to solving the mysterious disappearance of Tess as they get to know her aunt Haddie, who is actually three years younger than her niece, the children's mother. Right about now you may be thinking that The Kneebone Boy doesn't sound as complex and multi-layered as I proclaimed. It might be sounding like Lemony Snickett's Series of Unfortunate Events, Lois Lowry's The Willoughbys or Trenton Lee Stewart's The Mysterious Benedict Society. As I read it, I was reminded of Joan Aiken's Wolves Chronicles a series set in an alternative history in which 1800s England is overrun by wolves. 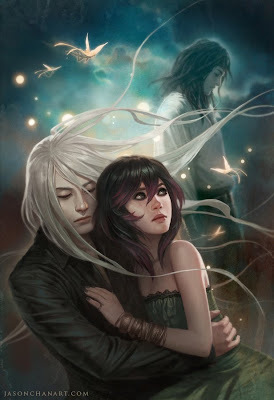 The amazing thing is, there is no magic in the book, or, as the heading for chapter 11 proclaims, "In which there are no vampires or ghosts, but you'll like this chapter anyway." At one point, when things are getting pretty strange and you think a bit of magic or magical realism might be creeping in to the story the narrator even pauses to inform you that it "is not that kind of story." Another amazing thing, there are no horribly mean adults, (á la Snickett, Dahl) and no evil villains (á la Snickett, Stewart) and no head-scratching endings (á la Snickett.) Potter takes the various plots of her story, the various genres employed and blends them together for a satisfying, believable end that, while it might leave you scratching your head, does so not because of holes in the plot but because you wonder why you didn't see it coming. What kids will probably realize about this book right from the start, adults might not come to see until after finishing the last page, closing the book and thinking about it for a while. Like her book SLOB, The Kneebone Boy is a story told by a child, from a child's perspective and with a child's eye for noticing minutiae while overlooking or omitting major occurrences and observations. Once you think about it from this angle, all the puzzle pieces fall into place and the picture becomes clear. And, without giving away too much of the ending, I can tell you that it is a bittersweet picture of a family coming to terms with the changes and loss that a father tried to shield his children from. Finally, one thing I have not mentioned yet - Ellen Potter/the narrator has a way with words, as well. Someday I will be the kind of reader/reviewer who underlines passages and sticks post-its throughout a book so that I can quote snippets of the beautiful writing that I often encounter. Until then, I am going to continue to stand on the shoulders of giants and quote from other reviewers. Librarian Liz, who runs the blog A Chair, A Fireplace and A Tea Cozy, which just got picked up by the prestigious School Library Journal, posted her succinct and well written review of The Kneebone Boy on September 1, 2010. 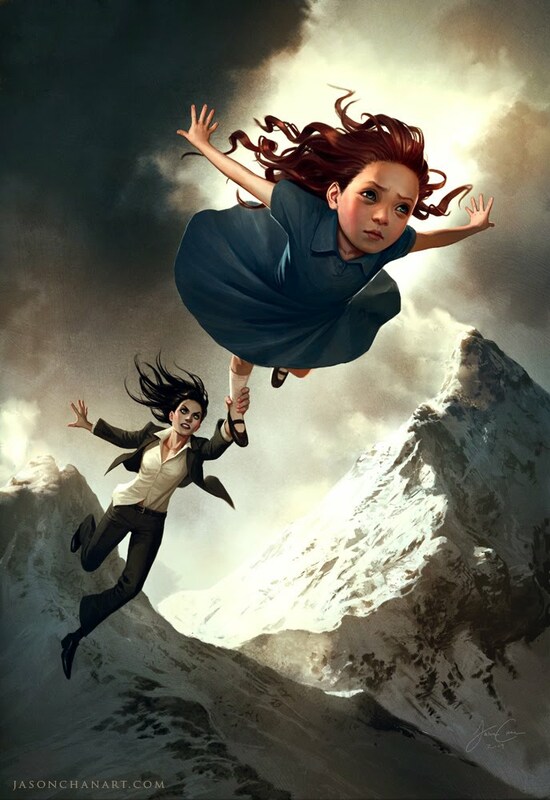 While speaking of the beautiful writing employed by Potter in the book, Liz quoted this passage that I think is worth repeating here: “All in all they were in that gorgeous state of mind in which they felt free and unafraid and sharply aware of how large and exciting the world was. In other words, it hadn’t gotten dark outside yet.” Another passage from the book that I especially liked finds the Hardscrabbles in the woods in the middle of the night, "picking their way through the woods, going who knows where, to do who knows what, dressed in pyjamas with lavender hippos on their bums. If there are illustrations in this book, I'd prefer that that last part not be shown." I also need to thank Liz for pointing me to this great post over at MacKids, a blog for Macmillan Children's Publishing Group. In her post, Year in the Life of a Book: Ellen Potter, Potter likens seeing the cover art for a book that you have spent the last 18 months writing, the design of which you, the author, have no control over, to hoping that the Closet Sprite chooses well for you when you try to decide what to wear for the day. You hope she "understands who you are deep down" because what you wear (or the art on your cover) is the first impression you will make. This is exactly how she feels about the covers of her books. And, when she opened the email with the cover art by the amazing Jason Chan, who also did the cover for Victoria Forester's The Girl Who Could Fly, which I have long wanted to read based on the cover art alone (just think how differently - and unappealingly - a book with this title could have been portrayed!) and the teen series by Lisa Mantchev, Theatre Illuminata, which combines Shakespeare's plays and faeries, she was gobsmacked, as the British might say. Of the illustration Potter says, the Hardscrabbles are "just exactly how I had seen them in my own head, but better somehow. Wiser. Bolder. Even a little stranger. " After reading the book, which Jason Chan clearly did, I couldn't agree more! Your reviews are always a work of art. I read them with as much enjoyment as I do when reading a great book. Thank you for this one! I'm honored.